The delegation includes a demonstration team that is comprised of 18 South Korean taekwondo practitioners and four coaching and supporting staff members. They will have an exclusive one-hour performance at Taekwondo Hall in Pyongang on Wednesday and will showcase a joint performance with the ITF demonstration team Friday. This is the first time since April that the Seoul-based WT demonstration team is having a performance in the North Korean capital. Back then, the demonstration team visited Pyongyang with a South Korean art troupe and also performed twice. 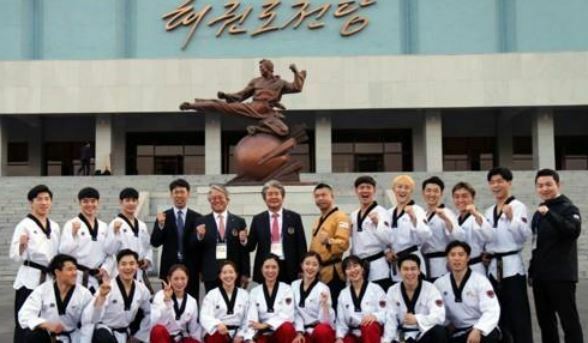 "Last time, it was our first performance in Pyongyang, so we emphasized taekwondo's powerful rhythm, but this time, we are putting more emphasis on storytelling," said Seo Mi-sook, the director at the WT demonstration team. "A 25-minute performance is usual for a performance with 18 taekwondo practitioners, but because we have to prepare for 60 minutes, there are lots of things that we need to take care of." Like the divided Koreas, taekwondo shares the same roots but is now separated by WT and ITF style taekwondo. The WT is currently the official international taekwondo governing body as recognized by the International Olympic Committee. The ITF has different sets of rules than the WT. The WT said it will emphasize a universal taekwondo, and its roots in its Pyongyang performance. Among the 18 demonstration team members, 11 performed in Pyongyang in April. "This time, we're more motivated," said Song Mi-ra, a coach at the team. "In April, we weren't that good because it was our first time. We want to do better this time." This year, WT and ITF already had joint performances three times. In February, ITF sent a demonstration team to South Korea for the opening ceremony of the PyeongChang Winter Olympics, as well as other performance stages. With taekwondo demonstration performances, WT hopes the Pyongyang visit can further strengthen its cooperation with ITF. In April, WT executive members weren't able to make the Pyongyang trip due to scheduling issues, but this time, WT chief Choue will lead the discussions.